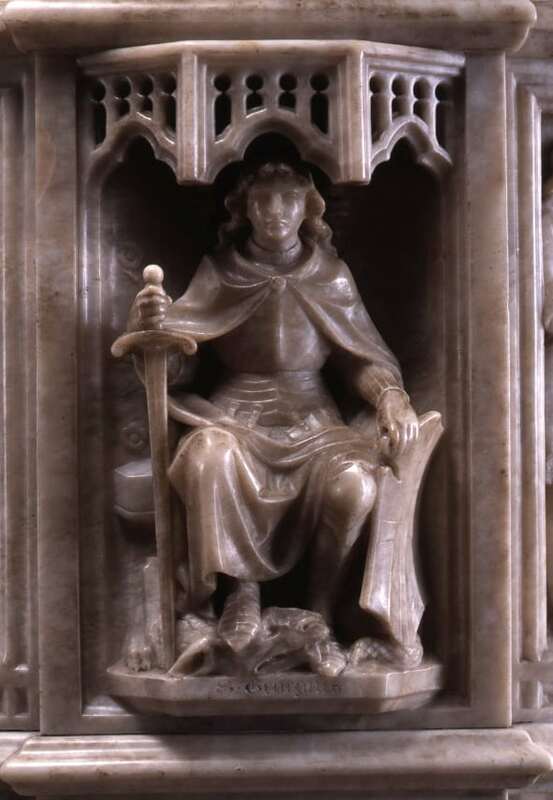 This depiction of St George appears on the Anson Memorial Font, located in the nave of the Chapel. The font was commissioned by Chapter in 1886 and was installed in the summer of 1887. Frederick Anson was a Canon from 1845 until his death in 1885. He was apparently well regarded and respected by the other Canons and the wider community. Upon the decision to commission a font in his memory, the Dean and Canons sent out a call for subscriptions, through which they raised over £300 (approximately £16,000 today). Mr J L Pearson was contracted to sculpt the font from alabaster. The question of what to depict on the font apparently caused some discussion in Chapter. Ultimately the chosen subjects were Moses parting the Red Sea, the baptism of Christ in the River Jordan, the baptism of Æthelbert of Kent (the first Christian king in England) and the baptism of King Edward III (founder of St George’s Chapel). These scenes are interspersed with figures of the four patron saints of the United Kingdom: St Andrew, St Patrick, St David and St George. Around the base of the font are figures of the four Evangelists. Each of these carvings is listed in Mr Pearson’s bill of 1887 [SGC XVII.61.32]. The image of St George presents a very different vision to the depiction which appears on the Memorial to Prince Albert Victor, although it was carved just a decade or so before. This St George is regal, seated in a throne-like recess. One hand is resting on his shield and the other grasps his sword. He is wearing a robe rather than armour, and his sword is pointing downwards. It would be easy to mistake him for a King were it not for the subdued dragon that lies at his feet. It seems clear in this instance that the depiction of a peaceful St George has been chosen with careful regard to the purpose of the font. The installation of the font receives a mention in the Register of the Chapel. Hugh George, son of Harry Arthur Carpenter, Sexton of the Chapel, and his wife, was the first baby to be baptised in it on 17 November 1887. He was baptised by the Dean, Randall T Davidson, and in the Register the Dean notes “The above was the first Baptism in the new ‘Anson Memorial’ Font in S. George’s Chapel” [SGC.R.2].